It’s often said that perception is reality. I beg to differ. Just because you perceive yourself to have good shooting technique doesn’t mean you actually do. If you want to improve a particular skill, you need to start by honestly assessing your current ability level. One of the most effective ways to do this is through video analysis. For decades, professional athletes have studied film to identify their opponent’s tendencies for later exploitation. But in addition to looking for chinks in their opponent’s armor, the dedicated athlete watches himself or herself with a critical eye, hoping to diagnose and remedy problem areas. These days, you don’t have to be an elite athlete with a huge training budget or have your own film crew to watch film of yourself. All it takes is a smartphone and someone to operate it or even a tripod to mount it to. 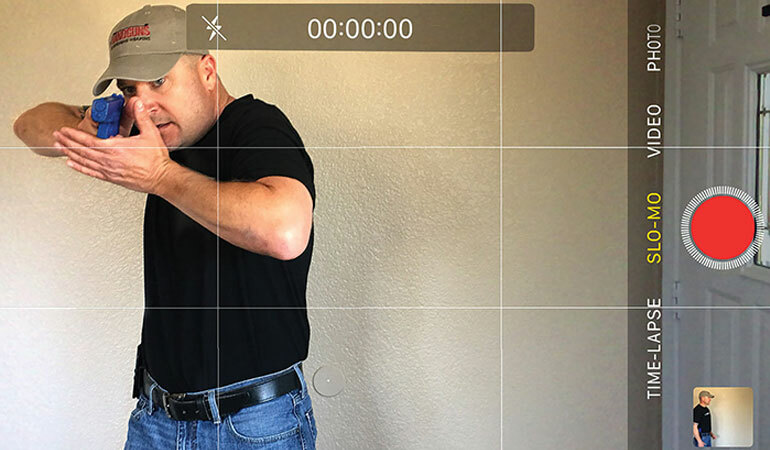 Recently, while taking Kelly McCann’s defensive handgun course, I witnessed firsthand the benefits of slow-motion video. Students conducted a series of timed draw and fire sequences. At the sound of the buzzer, the shooter would draw and fire a single round on an 8.5x11 sheet of paper posted seven yards downrange. The drill was meant to establish a baseline and was shot “cold” first thing in the morning or right after lunch. Private citizens shot the drill from concealment, and the cops in the class worked from their duty holsters. This simple drill was a good barometer for the defensive handgunner. The sheet of paper replicated the thoracic cavity—a primary target zone for personal defense. Seven yards was a realistic shooting distance, and the 1.5 second par time created a sense of urgency. To make things a little more interesting, the drill was shot one student at a time with McCann staring over his or her shoulder, working the timer, and another student filming the action with a smart phone in slow-motion mode. The drill was a good gauge for McCann and the students, but to me, the most enlightening aspect of this drill was reviewing the slow motion video. Perception isn’t reality. Slow motion is reality. I shot the drill fairly well, with my best hits perforating the target in about 1.3 seconds from my retention duty holster while incorporating starting positions such as hands at my side or hands raised. I was doing a lot of things right. 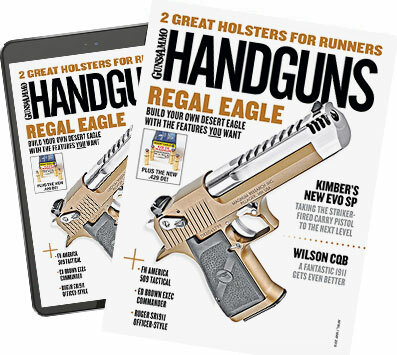 For example, my hands were moving simultaneously—when my right hand moved to my pistol, my left hand moved to my chest to accept the pistol and achieve a two-handed grip as early as possible. I was fast to the gun. I was consistent. However, slow-motion video made even the slightest technical imperfection seem like a major, glaring error. I realized I was mashing down so hard on my gun when establishing my shooting grip—in part to depress and rotate the holster’s securing hood forward—that it was forcing the bottom of the holster against my leg. This canted the holster in such a way that caused the pistol to drag during my draw stroke, wasting time. Then, instead of drawing my pistol up high, to my dominant eye, I tended to “scoop” the pistol slightly. This prevented me from seeing my sights as early as I should have. Instead of aligning my sights as I was driving the gun toward the target, I was having to hunt for them a bit as my arms extended to make the shot. This, too, was a waste of time. Had I not seen these mistakes with my own eyes—over and over, frame by frame—I would not have believed I was making them. And since repetition alone doesn’t necessarily improve performance, continued practice would not necessarily have solved the problems. I wasn’t alone either. Throughout the day, I saw my classmates staring at the screen on their smartphones on every break—and they weren’t texting, Web surfing or admiring how cool they looked. On the contrary, they were keying in on mistakes and considering how they could improve. As a result of expert coaching and a diligent review of the video, I modified my drawstroke slightly, mindful to not be so forceful when establishing my shooting grip. As a result, the pistol comes out of the holster more smoothly. Also, I draw my pistol higher, which enables me to establish a sight picture more quickly. Increasing the speed of your draw stroke isn’t just about athleticism. It’s about eliminating wasted motion. The more you can streamline your drawstroke, the faster you can get rounds on target. Also, by eliminating wasted motion, you increase consistency and predictability, which improves accuracy. Next time you’re at the range, have a buddy take slow-motion video of your performance. Heck, you could even set your phone on a tripod and record yourself executing dry-fire drawstrokes. Then, when you watch yourself, be critical. It should be painstakingly clear what you need to work on. With slow-motion video analysis, you can train smarter. Rather than blindly conducting repetition after repetition, you can tailor your training sessions to improve the specific areas that you’ve identified are lacking. If you want a more efficient and subsequently faster draw stroke, slow motion video is the way to go.